خداوندی که دوستار و دوست تمام آزادگان و آزاد اندیشان است امروز سالهاست که از شهریور 1367 میگذرد امروز سالهاست که عزیزان ایران را آرام و بی صدا در بیابان های خلوت زنده به گور کردند. امروز سالهاست تجاوز دژخیمان به نوامیس آزادی خواه مردم در سیاهچالها قبل از اعدام میگذرد ولی اگر دست بزنید بر زخم ها می بینید که هنوز زخم کهنه نشده است ، انگار همین دیروز بود که هزاران نفر را بدون محاکمه در حالی که سالیان سال از محکومیتشان می گذشت فقط به خاطر اینکه مخالف دیکتاتوری بودند در متفق ها سر به نیست کردند شاید دیروز و امروز را فراموش کرده بودند ولی امروز من و ما همان شهدای معصوم در گورهای دسته جمعی هستیم همان فرزندانی که سالهاست عقده گریه کردن بر مزارهای عزیزانشان گلوهایشان را می فشارد . ای دژخیمان چگونه فراموش کنیم صحنه های که خواهران و مادران ، برادران و پدرانمان را دستجمعی بدون اینکه روح از بدنشان جدا شده باشد ، نیمه جان از چوبه های دار به پائین می کشیدید و زنده زنده به گودال های گور دسته جمعی می افکندید و بر روی چشمان باز و روح و جسم آزادشان و قلب تپیندهشان خاک می ریختید . چگونه فراموش کنیم لحظاتی را که دستور می دادید لودر وبیل مکانیکی با فشار تیغه بکشند افرادی را که هنوز زنده اند و تلاش می کنند از گودال خارج شوند ، چگونه فراموش کنیم لیوان های سیانور صلواتی را که قبل از مرگ به آنها خوراندید ، چگونه فراموش کنیم هزاران تیر خلاصی که به سر عزیزانمان زدید ، امروز فردای دیروز شماست و فردا فردای سختی برای شماست و باید به مردم ، عدالت و تاریخ جواب دهید ، باشد که دست طبیعت درس عبرت به صاحبین دست های جنایتکار یدهد و آزادی را در پرتو خون آزادگان به میهن بازگرداند. Azerbaijani language rights activist Amir Abbas Banayi Kazimi was beaten and detained on 14 May at his home in Tabriz: he was reportedly first held at a Ministry of Intelligence detention centre, then moved on around 1 August to Tabriz’s central prison, where his mother was able to visit him. She told an interviewer from the Voice of America (VOA) Azerbaijani-language radio station that he had been tortured. The following day he was apparently moved to a Ministry of Intelligence detention centre somewhere in Tabriz, where he is at grave risk of torture. He has not been formally charged with any offence. On 4 August, his mother, Jamileh Kazimi, had told the VOA Azerbaijani-language service that her son had been detained for his defence of Iranian Azerbaijanis' right to use their language. She said that he had been tortured, causing his teeth to be broken, hair to be pulled from his scalp, and blue bruising marks all over his face and body. His father, Rahim Banayi Kazimi, who has been able to visit him once, reportedly stated that his son had begun a hunger strike to draw attention to his plight, but it is not known whether he is continuing with it. Iranian Azerbaijanis, who are mainly Shi’a Muslims, are the largest minority in Iran, constituting at least 25-30 per cent of the population. They live mainly in the north and north-west of the country. They are increasingly demanding greater cultural and linguistic rights, including the right to education in their mother tongue of Azerbaijani Turkic. A small minority advocate secession of Iranian Azerbaijan from the Islamic Republic of Iran and union with the Republic of Azerbaijan. Those who seek to promote Iranian Azerbaijani cultural identity are viewed with suspicion by the Iranian authorities, who often accuse them of vague charges such as "promoting pan-Turkism". In May 2006, massive demonstrations took place in towns and cities in north-western Iran, where the majority of the population is Iranian Azerbaijani, in protest at a cartoon published on 12 May by the state-owned daily newspaper Iran, which many Iranian Azerbaijanis found offensive. Hundreds were arrested during and after the demonstrations. Other waves of arrests have occurred around dates significant to the Azerbaijani community, such as a boycott of the start of the academic year in September 2006, after demonstrations in February 2007 on the occasion of International Mother Tongue day, and on the anniversary of the May 2006 demonstrations. On Sunday August 26th and Wednesday August 29th a prayer session was conducted on behalf of political prisoners in Iran. Number of political prisoners including Keyvan Rafiee, Behrouz Javid Tehrani, Farzad Kamangar, Abolfazl Jahandar, Saeed Derakhshandi, Babak Dadbakhsh and Mostafa Daryanavard were mentioned by name and there was a general prayer for all political prisoners in Iran. I would like to thank Solid Rock Ministry for remembering these freedom fighters in their prayers. These individuals are currently in prison and under unbearable conditions and it is wonderful to know that they are not forgotten and that they are close to our hearts regardless of the distance and the prison walls. Iran’s Ministry of Intelligence has Sa'id Metinpour in custody. He has been a victim of torture, his health is fragile and his rights to judicial and medical assistance have been denied. Sa’id Metinpour is now known to be held in Section 209 of Evin prison in Tehran, which is run by the Ministry of Intelligence. He has reportedly been tortured, apparently to try to force him to make a videotaped “confession”. He is believed to be held mainly in solitary confinement. According to other detainees, his health is poor as a result of the treatment he has suffered. He was arrested on 25 May in the north-western city of Zenjan. Amnesty International believes that he is a prisoner of conscience, held solely on account of his peaceful activities on behalf of the Iranian Azerbaijani community. He has not been allowed to meet his family or his lawyer, and his sole contact with the outside world has been a few extremely brief telephone calls to his family. Prior his arrest in May, Sa’id Metinpour had been detained in February 2007 and held for 10 days in connection with his participation in peaceful demonstrations marking International Mother Language Day, an annual event initiated by the United Nations Educational, Scientific and Cultural Organisation (UNESCO) on 21 February. Iranian Azerbaijanis demonstrated throughout May 2007 to mark the first anniversary of protests during which the security forces reportedly killed up to 19 people and arrested hundreds. The May 2006 protests were organised against the publication in a national newspaper of a cartoon which was offensive to many Iranian Azerbaijanis. According to news received by Human Rights Activists in Iran Abolfazl Jahandar was taken to the criminal court section 59/10 on Wednesday August 22, 2007. Mr. Abolfazl Jahandar was not represented by a defence lawyer, and he was astonished to find out that seven (7) new charges were laid against him. This came as a major surprise since Mr. Jahandar had already been tried and sentenced to 2.5 years of imprisonment,, and was serving the sentence when these new charges were laid against him. Mr. Jahandar also served 6 months of pre-trial custody. Human Rights Activists in Iran condemn new charges being laid against political and human rights activists who have already been tried and are serving their sentence. When I first saw the video of Hossein and Majid Kavousifar I did not undrestand why he was smiling while being taken to his execution. Two weeks ago I was looking for a good Akbar Mohammadi picture to frame, I chose one where he is wearing a suit, there is no smile on his face. My dad told me that I should find a picture where he is smiling, because we should never show the enemy that we feel sad, discouraged or defeated. Thats exactly what I did, I found a picture of him smiling. I recently had the pleasure of reading Akbar Mohammadi's Memoirs, a quote stuck with me "I am not afraid of death. It is quite true that life is precious, life is sweet but for freedom and in defense of the people, death is even sweeter"
I have been thinking about Kavousifar's and Akbar Mohammadi's smile for quite sometime now, and it finally came together. Now I undrestand why he was smiling. On Sunday August 12, 2007 I attended the remembrance service for Akbar Mohammadi, student activists, political prisoner and a real national hero. Akbar Mohammadi was arrested during the famous July 9th 1999 (18 Tir) pro-democracy student demonstrations. He was accused of being one of the leaders of the student movement. The Islamic Regime officials tortured him for months in the most brutal way in order to obtain a confession from him, however even under the most brutal and inhumane conditions he refused to confess either against himself or against any of the other students that were involved in the demonstrations. Eventually he was sentenced to death, but due to extensive international pressure his sentence was reduced to 15 years imprisonment. Akbar Mohammadi died in the Evin prison in August of 2006 while he was in hunger strike, and under very questionable circumstances. It is strongly believed by many Iranians including myself that Akbar was murdered in prison by Islamic Regime officials, because of the great fear the Regime felt towards this brave Iranian man. About 300 people attended this event. There were a number of speakers from different political parties, as well as number of great poets and Iranian artists. My two favorite speeches were of Manouchehr Mohammadi and Kourosh Sehati. Manouchehr is Akbar’s brother and was arrested at the same time as Akbar and went through the same tortures and was in prison with Akbar for seven years. He was forced to escape from Iran after Akbar’s death. He spoke about his memories of Akbar especially in prison. Kourosh Sehati is also a student activist who was Akbar’s cellmate for two years. He also spoke about his memories with Akbar. Listening to these two men was a great pleasure and helped me know Akbar on a more personal level. I also had the great honour to speak at this event; I attended on my own behalf as well as on behalf of Human Rights Activists in Iran, a group I am working with very closely. I also had the pleasure to deliver number statements that were sent from Evin and Gohardasht Prison in support of Akbar Mohammadi and his family. All statements were read throughout the event and I know his family very much appreciated the gesture of these freedom fighters in Iran who saw Akbar not only as a friend but also as a real leader. In conclusion I thought it was a great event, although I would have liked to have seen more people participate in an event remembering a great national hero who gave up his life for a free Iran. It can be easy to lose hope especially when we saw 5000 Iranians attend a Dariush concert the night before this event, however only 300 people were willing to attend this particular event. However I cannot and will not lose hope, because as long as Iran has such brave and freedom loving young men and women following in Akbar Mohammadi’s footsteps and fighting for justice, democracy and freedom the Islamic Regime will never win. Human Rights Activists in Iran are writing to express their grave concern over the illegal arrest and detention of Keyvan Rafiee, a 23 year old human rights activists and the spokesperson for Human Rights Activists in Iran. Mr. Rafiee has still not been formally charged with an internationally recognizable criminal offence. It is important to note that in the past year Mr. Rafiee has not been able to see his lawyer even once, and his lawyer has not been allowed to attend court. His trial which had been set for July 29th 2007 was adjourned for the fourth time, due to the non-attendance of the prosecution. A new trial date has not been set. The Human Rights Activists in Iran strongly believe that the constant postponement of the trial is due to the fact that eh prosecution has absolutely no evidence against Mr. Rafiee and is keeping him in prison in order to be able to build a case against him. The Human Rights Activists in Iran ask that European Union raise this specific case and insist that the Iranian government respect its obligations under international human rights law. E.U. should call for the release of Keyvan Rafiee or in the alternative for him to be charged with an internationally recognizable criminal offense and accorded a trial that meets international fair trial standards. We ask that the E.U. take a strong stand against human rights violations in Iran, which has been increasing the past year and to ensure that the rights of individuals such as Keyvan Rafiee, who are detained solely because of their peaceful expression of their beliefs and ideas are protected. We thank you for your attention to this important matter. According to news received from Section 209 of the Evin Prison, since his arrest Mansour Osanlou has been subjected to brutal physical torture. Mr. Osanlou who is the head of the Executive Committee of the Syndicate of Workers of Tehran and Suburbs Bus Company, was kidnapped and illegally detained a number of weeks ago by the Intelligence Ministry. He has been so brutally tortured during interrogation that his ribs are severely damaged and it was seen by other prisoners that while he was being taken to interrogation he was walking with great difficulty. His family have not been able to contact him since his arrest and are extremely concerned about his health and well being. Human Rights Activists in Iran are extremely concerned about Mr. Osanlou’s health and well being and ask for his immediate and unconditional release. Three Amir Kabir students Ehsan Mansouri, Majid Tavakoli and Ahmad Ghasaban are still in section 209 of the Evin Prison which is under the control of the Intelligence Ministry. Since their arrest they have been subjected to brutal physical and psychological torture. In protest to their inhumane treatment, these student have gone on a hunger strike and there is great concern for their health and well being. According to news received from Section 209 of the Evin Prison, Mr. Farzad Kamangar, a political prisoner that has been on hunger strike since Tuesday July 31st 2008 has been sent to solitary confinement. Mr. Kamangar had gone on a hunger strike in order to protest his inhumane treatment in the Evin Prison. It is believed that he was put in solitary confinement in order to increase the pressure on him and make him end his hunger strike. Both his family and former cellmates are extremely concerned about his health and well being. It is important to mention that Mr. Kamangar has been in custody for more then 11 months and has not had access to a lawyer, phone calls or visitation with his family. Human Rights Activists in Iran are extremely concerned about the health and well being of Mr. Kamangar and ask all human rights organizations to condemn the inhumane treatment of political prisoners in Iran. According to news received from Section 209 of the Evin Prison, political prisoner Farzad Kamangar has been on a hunger strike since Tuesday July 31st 2007 in protest to his inhumane treatment in Section 209 of the Evin Prison in cell number 121. Mr. Kamangar has been in prison for the past 11 months on charges of being in contact with opposition groups. In the past 11 months Mr. Kamangar has not had any access to telephone, has not had any visitation rights and has not had access to a lawyer. Human Rights Activists in Iran have also received information that Mr. Kamangar was also tortured both physically and psychologically in Kermanshah prison and had gone on a 30 day hunger strike prior to this current strike. Human Rights Activists condemn the fact that Mr. Kamangar has not had access to his lawyer, visitation rights or even the right to make phone calls, and express their grave concern for the health and well being of Mr. Kamangar. I did not realize what it was until a few seconds into it. I have to admit I did not have the strength to watch it all, and stopped at the point where these young men stand at the noose smiling. Hossein and Majid Kavousifar were convicted of the murder of a top revolutionary court judge, who was responsible for the imprisonment of many political prisoners. They were hanged on Thursday in Tehran in public. While I in no way advocate violence and am actually completely against it, I do believe these executions took place for political reasons rather then criminal. In the past month alone more then 42 people have been executed in Iran, number of them publicly. 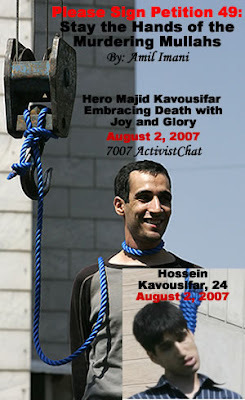 The execution of Majid and Hossein Kavousifar was the first public execution in Iran in the past 5 years. This is Islamic Regime's way of spreading fear and terror among Iranian people especially dissidents and to show that no one is safe. In the face of last months protests against the rationing of oil as well as non stop advocacy by women, worker, teacher, student and journalist groups Islamic Regime knows that it is in trouble and will not stop at anything to silence these voices of opposition. If we are not careful, alert and active there is no guarantee that the mass executions of 1988 will not be repeated. I really don't know what I found to be more disturbing in this video, the nature of the execution being public, or the fact that thousands of people gathered to watch, man of them smiling or the silence of millions of Iranians as well as the International Community in the face of such atrocities. Even though Iranian authorities let 5 students go, the three still detained have complained of torture and ill-treatment. Five of the students named above were released on bail on 18 July. Ahmad Qasaban, Majid Tavakkoli and Ehsan Mansouri have reportedly begun a hunger strike in protest at their continuing detention. They are reportedly being subjected to torture. The families of the three remaining detained students have reportedly been able to visit them twice since their arrest. On 24 July the families wrote an open letter to the Head of the Judiciary, Ayatollah Mahmoud Hashemi Shahroudi, in which they describe publicly for the first time the torture and ill-treatment of the students. The three students reportedly told their families that seven of their interrogators simultaneously had beaten them severely with cables and whips. Their interrogation sessions sometimes lasted up to 24 hours or would take place in the middle of the night. They were kicked in the arms, chest and back and punched in the face and on the head, so that they fell off their chairs and were then thrown against the walls. They have been forced to remain standing for up to 48 hours and forced to stand on one leg for up to 18 hours. They have been prevented from receiving medical care. Interrogators also told them, falsely, that members of their families had been arrested, beaten or harassed, or were ill. The families had previously written three times to Ayatollah Shahroudi expressing concern that their children were being physically and psychologically ill-treated to make them confess to crimes they had not committed, and asking him to take action to halt this. Abbas Hakimzadeh and Ali Saberi, who are six months from finishing their studies at Amir Kabir University in Tehran, have reportedly been suspended for two terms and banned from entering university premises. The crisis at Amir Kabir University started on 30 April 2007 with the publication of student newsletters carrying articles which university officials deemed insulting to Islam. These newsletters, bearing the names and logos of four student publications, were distributed throughout the campus. They contained three controversial articles and two caricatures which could have been perceived as critical of the Iranian regime and insulting to Islam. Distribution of the publications took place one week before the annual elections to a student union, the Islamic Students’ Association (ISA). One article questioned the infallibility of the Prophet Mohammad, the first Shi’a Imam, Ali and the place of Supreme Leader Ayatollah Ali Khamenei. Another criticised the government's crackdown on women’s clothing, and a third ridiculed Islamic women’s attire.